Nestled between Terrace Park School and the Mountlake Terrace Off-Leash Dog Park, the Mountlake Terrace Recreation Pavilion (5303 228th Street SW, Mountlake Terrace, WA 98043) is an incredible multi-purpose facility packed with amenities to take advantage of! When we asked Brian Hayter what people in MLT like to do for fun, the Recreation Pavilion was at the top of the list, and it also came highly recommended by Shelly Katzer as well! This dynamic community center offers so many amenities to the MLT community, and we wanted to share a few of our favorite things about the community center that are not to be missed! 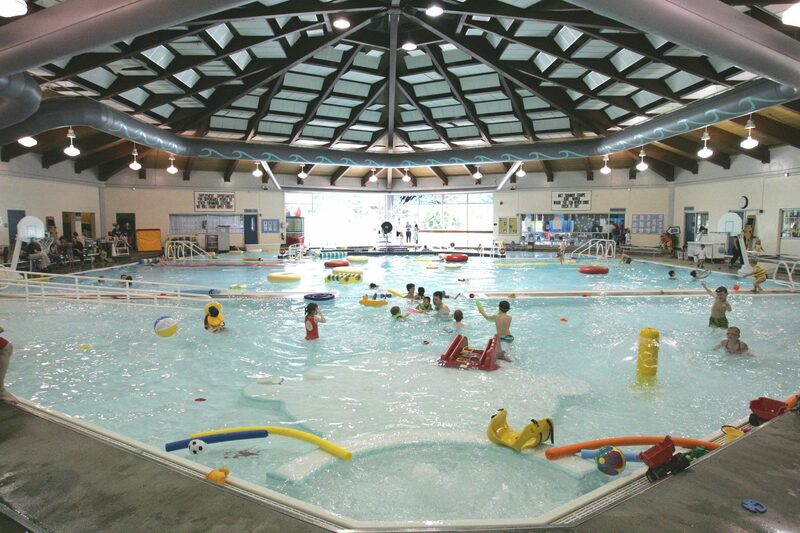 This warm-water pool not only is home to swimming lessons and a range of classes, but it also includes a lazy river with a current, spray toys, a beach-like entry leisure pool, a therapy pool, handicapped access, a sauna, and more. Plus, you can even rent out the pool for parties! Kids programs, like preschool, before & after school care, and summer camps! Keeping kids busy is easy with this community center in your city’s backyard! There are 3 preschool options for kids ages 3 to 5, each program providing a unique set of offerings. Kids Krew offers before and after school care for kids ages 5 to 12, and a huge variety of summer camps include themes like swimming, dance, basketball, tennis, and general youth camps. The huge variety of fitness classes and sports leagues. Whether you’re into something super upbeat (like Turbo kick or Zumba) or something a little more low-key (like yoga and Tai Chi), the recreation pavilion has a large selection to choose from. If playing on a team is more your style, adults can participate in basketball, racquetball, softball, volleyball, and racquetball sports. Sign up with a friend and meet your neighbors! The MLT Recreation Pavilion is open 7 days a week. Whether you want a workout before work or the kids need to burn off some energy on a rainy Sunday, the pavilion is open and waiting to be used! Hours include Monday – Thursday 6am – 9:30pm, Friday 6am – 7:15pm, Saturday 7am – 8pm, and Sunday 8:30am – 7pm. Mountlake Terrace residents get a discount. Whether you’re using the pool, buying a pass, or taking a class, all MLT residents receive a discount on using this facility. You can view all 2017 fees here. Check out the complete Recreation Program Guide here!